Our brand—the entirety of the logo, visuals, and messaging we use to describe AALL—enables us to establish and maintain a clear, unified brand identity to communicate to our members, our stakeholders, and the public in a cohesive and compelling manner. Launched in October 2016, chapters were asked to update the AALL logo and name in your communications and on your websites. The AALL Brand Book for Chapters is provided to help you incorporate both in a manner that is consistent with the new brand. We realize that each chapter is different and may need individual guidance; we are happy to help. Please feel free to contact AALL Director of Information Technology Christopher Siwa if you have any questions or concerns about the best way to implement the new brand. 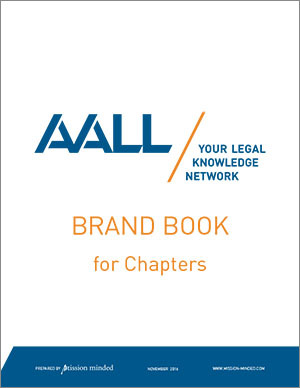 The AALL Brand Book for Chapters is a helpful reference tool for you to use when incorporating the new brand.